Almondsbury is situated seven miles north of Bristol. It is an attractive village, nestled below the steep wooded Almondsbury Hill. 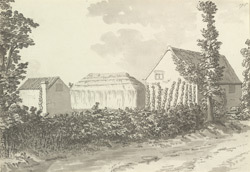 Grimm drew this sketch in the late summer of 1789. Note the hayrack in the centre of the drawing - something has gone awry with Grimm's usually expert handling of scale and perspective!